A great news MU Philippines is now going to air again and many players are expecting to bring back the old MU. this is one of the intriguing news because after many months of waiting again they are going to rise again. " pero maraming nagsasabi na ito ay isang pakana lang at pwede ring hindi." the old characters and items in our iventory is vanish and we will start again a new journey kahit papano nabuhayan kami ng loob kasi mag kikita nanaman kami sa iisang server at puro pinoy. pero yon nga mag start ulet kami sa panibago at iyon ay isang di kanais nais. pero okay lang kaya pa naman. Mu Philippines is going to release view testing mode tommorow July 1 until July 7. they are going to see and modify and fix what are the bug and errors. So what are you waiting for Play and Download the games and make again a new Journey. a New items and a new Map together with the hot and amazing new character Rage Fighter. this is one of the hot and lovely games ever. 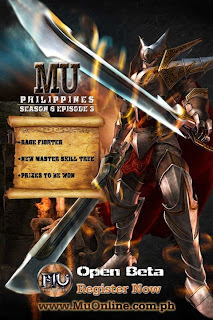 the MU Philippines... Visit the official website..
he rift between Ara Mina and sister Cristine Reyes seems to be far from over, even after the latter publicly apologized to the former on “The Buzz” on Sunday, June 24. “A stiff apology is a second insult...The injured party does not want to be compensated bec he has been wronged; he wants to be healed bec he has been hurt." -G.K. Chesterton,” Ara posted. Ara also retweeted messages from netizens criticizing Cristine’s apology. According to a report in “TV Patrol” on Monday, June 25, Ara said she did not feel Cristine’s sincerity and remorse. The report also said that Ara was offended at the way Cristine expressed her apology. "I’m sorry and I would like to apologize if ever I offended you, sumama ang loob mo sa akin. I tried my best na pumunta sa iyo, alam mo iyan Ate. Sinabi ko pa iyan sa iyo na kung gusto mo luluhod ako sa harapan mo,” Cristine said in her public apology. The night after the apology, Ara tweeted quotes about sincerity, credibility and remorse.